This site is dedicated to all those woodworkers out there who want great quality with ease. 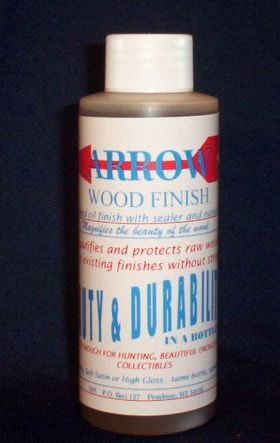 Arrow Wood finish is in some ways a throwback to an earlier time when "Hand-Rubbing" was the norm for fine finishing. However, in our fast paced world, people no longer have the time to rub in 30 coats or more of finish on each project. The rise of many modern, faster, finishes has somewhat hidden the truth that the hand-rubbed oil finish was more durable, and kept the wood in far better shape than a "spray on" coating. ARROW WOOD FINISH is the answer! It is as fast or faster than spray painting and gives "violin" quality with "gunstock" toughness incredibly easily. We will give basic instructions to acquaint you with it's marvelous properties and then we'll examine some advanced techniques. Simply stated: Arrow Wood Finish does everything except color or stain the wood. It fills the grain and removes scratches and other damage to the wood (including on both finished and unfinished wood)! Then it seals the wood to improve water and weather resistance while remaining flexible. And thirdly, it builds a finish that can be as dull as a matte finish on a Garand stock or as shiny as a poly finish on a Weatherby ... or ANYWHERE in between ... without ever requiring a dust free environment or steel wooling between layers! It will bring out the richness of the actual color of the wood,but it will not stain it.